You would think that in Montreal, this bastion of diversity and summer festivities, a multidisciplinary queer arts festival would be a well established tradition by 2018. Surprise! It isn’t. Before last year, Montrealers had no yearly occasion to celebrate queer artists and their works from a variety of mediums. Then came the Rose Festival. This burgeoning, multidisciplinary festival just wrapped up its second edition May 13 after a weekend showcasing Montreal’s LGBTQA+ creators. The festival was comprised of five events that mixed exhibitions and performances, beginning with an opening vernissage of sculpture, photography and illustrations on May 10 at the Mainline Gallery. The following day saw artists reading new work of poetry and storytelling. Actor Anton May, who participated in the first Rose festival in a theatre performance, noted how much the event grew by its second edition. “Last year, it was mainly focused on the queer writers in Montreal. But this year it has grown and now it really showcases all the talents of the community from dance, to art, spoken word and of course the emerging queer playwrights,” said May. “Queer representation is something that is lacking on the main stages in the Montreal theatre scene,” he continued. 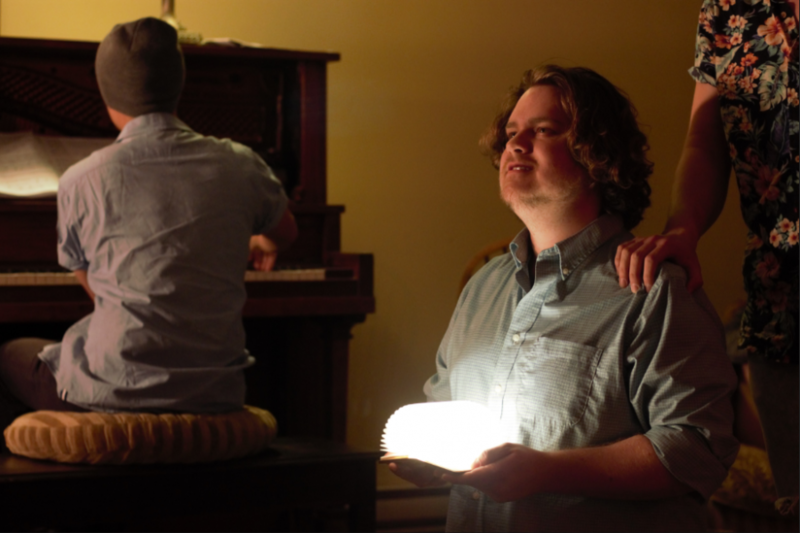 On May 13, director Russell Wustenberg and performers James M Brown, Patrick McGill and Jerome de los Santos debuted an art song opera performance in two parts in the lobby of the Mainline theatre. The performance was a blending of the works of 20th century composer Benjamin Britten, whose lover Peter Pears often starred in his operas. “From a modern perspective, when you look at Britten and Pears, they are [seen as] this quaint seaside couple writing revolutionary English opera, and the reality is that they were so secretive about their relationship that supposedly not even their housemaid knew and yet we have [Britten’s] work that as modern queer individuals we all resonate with,” explained Wustenberg. He called their creation a reclamation of the queerness that is present in the subtext of Britten’s work, which today can be brought to the front in ways Britten and Pears couldn’t at the time. Everything from the music to the lyrics are Britten’s original work but reordered to highlight the previously overlooked queer undertones. “Everything was already written, we just kind of molded it in a way to tell our own story and our own take on it,” said Santos, who played the piano to accompany the singers in the performance. The four artists echoed a sense of appreciation that with the Rose Festival they have a place to showcase their art where it can be fully acknowledged. Hodgson voiced hopes for the future of the Rose Festival, like gaining non-profit status, finding grants to better solidify their ties with the community and potentially locating a more permanent space to showcase queer art. May hopes that by the third edition of the festival, some of the more mainstream theatre houses in the city will participate.